They come and go. Their shows are, to say the least, massive in all senses of the word: good sound, nice performance that addresses the real issues. Yet Malawian musicians seem not ready to take their lesson on how well things should be done in music. Only last week there was an astounding performance by the Ivorian Dobet Gnahoré, who performed at the French Cultural Centre. There was so much to learn from her. She captured her audience with a mesmerising voice and daunted them when she played typical traditional African music instruments. That is not talking about the way she combined choreographic and theatrical elements in her dancing antics. But the greatest lesson Malawian musicians must have learned from her, if they missed such a lesson from other African gurus who have performed here like Hugh Masekela and Oliver Mtukudzi, is that they must keep a safe distance from politics. That is to say, they must never take political sides when they tackle politics. May be they can take political sides in the music, but going into mainstream politics kills their art. In sharp contrast, our musicians’ live shows leave a lot to be desired. Save for a few artists, there is neither coordination nor organisation, so much that at times, going to such shows you end up enjoying watching fights among patrons than what is going on on stage. 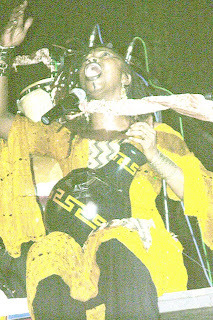 Ethel Kamwendo-Banda curtain-raised the Gnahoré show. She is one of the few Malawian musicians you can bet a tambala on when it comes to live shows. She knows how to conduct herself on the stage. Yet, she said there is a lot she learned from Gnahoré, who was coming straight from the Harare International Festival of Arts (Hifa) in Zimbabwe and soon after the FCC show left for Nairobi, Kenya to perform. Ethel admitted there is a lot to learn when international artists perform. “There is a lot we must learn from the foreign artists. You can look at Gnahoré, there were only four people on the stage but talk about the quality of the sound! Look at how she was dancing and certainly you realise there is a lot we must do to get there,” said Kamwendo. Concurring with her, Ben Mankhamba—who has basked in Malawi live performance glory in the deceased Kuche Kuche music awards—believes Malawian musicians must seize the opportunity to learn from foreign stars. That, he says, is because the ‘big Malawi stars have little lessons to offer’. “We lack the idols to emulate. When foreign artists come, you know that they can’t come this far for nothing. They have something to offer and we must learn from them. We have always believed that big is better, but I will tell you, they can have four men on stage, yet the sound is so tight,” said Mankhamba. According to him, by watching more international lessons, Malawian musicians set standards for themselves. While looking at the fireworks on the stage, one would also appreciate the international artists address relevant issues, in an artistic way. They walk arts, think arts, talk arts, drink arts and, of course, dream nothing but the perfection of the arts. That is in sharp contrast to our musicians who want to use the arts as a springboard into the political sphere. Yet, big time international stars like Masekela and Mtukudzi have remained steadfast in music, in spite of the great roles they have played in shaping their countries’ politics. Gnahoré proved herself to be in that league. Talk of politicians and enriching themselves, would you say that Malawian musicians who go into politics do so because there is better money there than in music, where they belong? Obviously, music may not be a lucrative business if your music is not good. Your music is never good if you seek to please some politicians. If you sing politics, you do not sing for the people. If you do not sing for the people, who will buy your music, let alone patronise your shows, except the handful you seek to please? There is more to singing about and for the people than just getting a guitar and tell your clumsy story. Your effort must be seen, to present your viewpoint and stand artistically. Gnahoré proved, as did other international stars before her, that real art takes a fair stand. 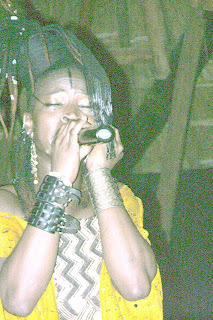 She sings about Africa—the beauty of the land and its smilling people, the power, love and beauty of the African woman. Backed by Mehrezi Nabi on bass guitar and vocals, Boris Tchango on drums and Gnahoré’s songwriter husband Colin Laroche de Féline on the lead guitar. Her themes touch the heart. For instance, you can no longer think of taking up arms to go to war when you listen to one of her songs. “Pourquoi la guerre qui tue nos enfants,” she wonders, surprised why there should be wars in the world, wars that kill our children. And on the beauty of Africa and its philosophy, she goes down to the notions emphasised in the great poetry of Africa’s great writers like Leopold Sedar Senghor, Aimé Cesaire, Birago and David Diop. “Les morts ne sont pas morts, ils sont dans nos reves,” she says, meaning the dead are not dead, they are in our dreams. You may wonder, why the usage of French? That is lesson four: music is a universal language, music is the language. International stars like Mtukudzi sing mostly in their mother languages, yet they are loved world over. Many Malawians do not understand a word of what Mtukudzi sings, yet their hearts are touched by his music. On her part, Gnahoré trekked from French to Wolof to Malinke and other West African languages, which could not be understod by the majority of the people who patronised her show. Yet, that was no reason for them not to enjoy it. The repertoire was universal in itself: Djiguene, done in Wolof talked about gender equality, Dala, coming in the Dida language called for all to respect people more than they do money, Massacre and Pillage were done in French. Although the predominantly English-speaking audience may have missed the messages in the songs, Gnahore’s sweet melodic voice left them compelled that she had something to say, and she expressed it all from her heart. “We get free lessons from these international stars. As musicians, we are invited to such shows and at times we are told to pay half the charge. What we learn and the amount we pay for it is miles apart,” said Mankhamba.